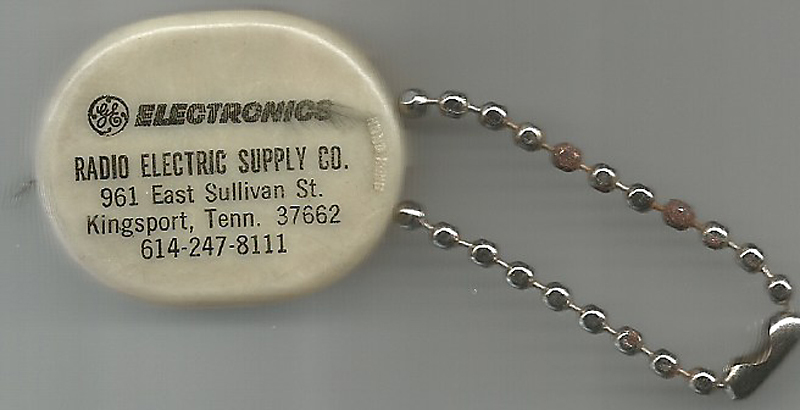 However, in 1945, the company is listed at 210 Cherokee Street (near the alley behind the bank) (across from where Kingsport Camera Shop used to be), you know the place. This little measuring tape (I haven’t chanced pulling the tape out to see how long it is) was made in Hong Kong. That the trademark is “HONG KONG” and not “Made in Hong Kong” places this in the ’60s. This entry was posted in Bob's photos, Uncategorized and tagged HONG KONG, Radio Electric Supply Co. Kingsport TN on November 8, 2015 by Bob Lawrence. My mom worked here for over 30 years. I still have a few items with their name and address on them. Oh no. They got the area code wrong! Whoa! I didn’t catch the mistake! Keen eagle eyes, there! The area code then was 615, not 614. 614 is Columbus OH.